The month of Ramadan begins this weekend! This weekend marks the beginning of Ramadan, the ninth month in the Islamic calendar and a time of fasting for many Muslims across the world. The month of Ramadam lasts for either 29 or 30 days, depending on sightings of the crescent moon, and ends this year on the evening of 28 July. Ramadan is the fourth of the five pillars of Islam. The Qur’an, the holy book for Muslims, was first revealed to the last Prophet Muhammad during this month. Fasting is obligatory for almost all adult Muslims, except young children, the elderly and those who are ill, pregnant or have other reasons why fasting might be harmful to them. Fasting takes place between dawn and sunset and during this period Muslims abstain from eating and drinking. Many Muslims will come together with friends and family to break the fast with a large meal late at night (known as the ifthar) and one very early in the morning (known as the suhoor). Fasting helps teach Muslims self-discipline and to be generous to others. It also reminds them of the suffering of the poor who might not be able to afford to eat well. Many try to become better Muslims during Ramadan so will try to give up bad habits, pray more and and will attempt to read the whole of the Qur’an at least once during the period. There are also special services in Mosques during Ramadan where the Qur’an is read. The end of Ramadan is marked by a big celebration called ‘Eid-ul-Fitr’, the Festival of the Breaking of the Fast, when the first sighting of the new moon is seen in the sky. 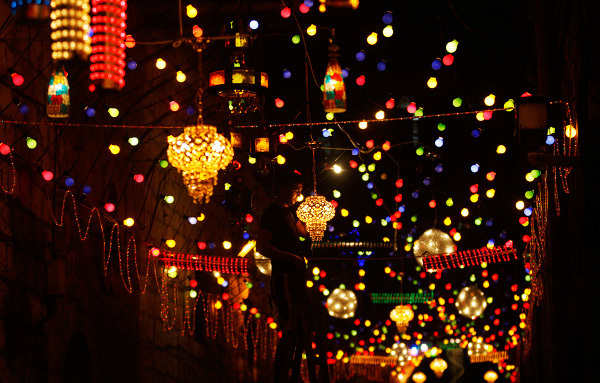 Muslims celebrate the end of fasting and thank Allah for the strength he gave them throughout the month. There are lots of celebrations and a special meal in eaten, the first daytime meal many Muslims will have had for a month. During Eid-ul-Firt, Muslims will decorate their homes, dress in their finest clothes and give gifts to children and one another. Many Muslims will donate money to charity during Ramadan and Eid-ul-Fitr so poorer Muslims can join in the celebrations too.